08. N.Rimsky-Korsakov. "Flight of the Bumblebee"
09. A.Khachaturyan. "Dance with Sabres"
11. A.Piazzolla. "Chigulin de Bachin"
09. J.Rossini. Cavatina Figaro from the opera "The Barber of Sevilla"
12. R.Galliano. "Tango for Claude"
14. V.Gridin. 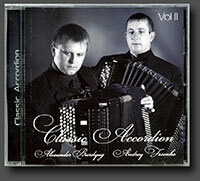 "Lively Round Dance"
Olexandr Burdyug and Andry Fesenko are graduates of Prokofiev Donetsk State Academy of Music (Ukraine). They are laureates and participants of international competitions and festivals. They have various performances in Ukraine, Poland, Hungary, Italy and Germany. 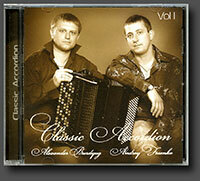 They are teachers of bayan/accordion at Bortnyansky Sumy High College of Art and Culture (Ukraine).